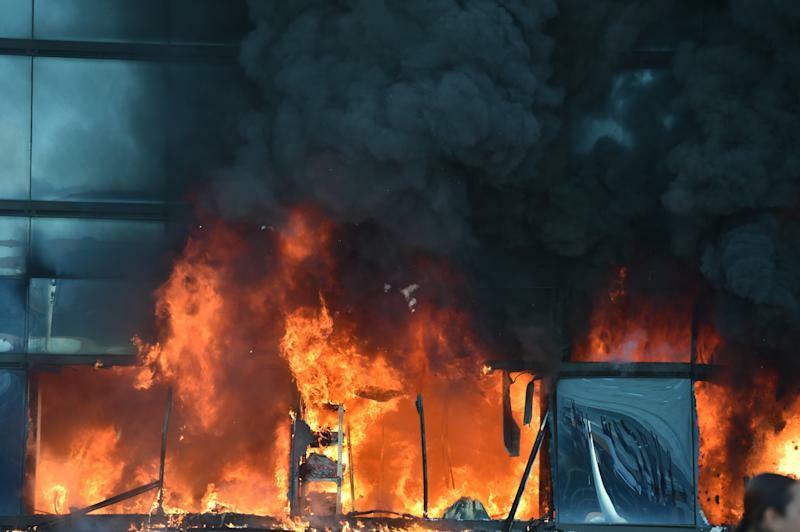 Chilpancingo (Mexico) (AFP) - Protesters torched a state government building in southern Mexico in a day of angry demonstrations over the disappearance of 43 students missing since gang-linked police attacked them. Hundreds of students and teachers ransacked Guerrero state's sprawling headquarters in the regional capital Chilpancingo, allowing workers to leave before breaking windows and setting a building on fire. The protesters called for Governor Angel Aguirre to resign as they fled the area while flames and plumes of black smoke billowed from the ground floor of a building's broken windows. Dozens of state police reclaimed security while firefighters battled the blaze. A small truck was also set on fire near the complex. No injuries were reported in the fires. The attack on Aguirre's offices came after clashes between riot police and protesters armed with rocks and sticks at the gates of the state congress. Some 150 police used shields to keep about 500 protesters away from the state legislature. Five teachers and two officers were injured, an AFP correspondent said. Protesters had already set fired to the local parliament's library in a protest days after the students disappeared. Ramos Reyes, leader of the CETEG teachers union, told AFP that protesters will "radicalize" their actions on Tuesday if Aguirre fails to give information about the students' whereabouts. He said the protesters planned to seize town halls across Guerrero. The state's interior secretary, Jesus Martinez Garnelo, said more riot police will be deployed in Chilpancingo on Tuesday. 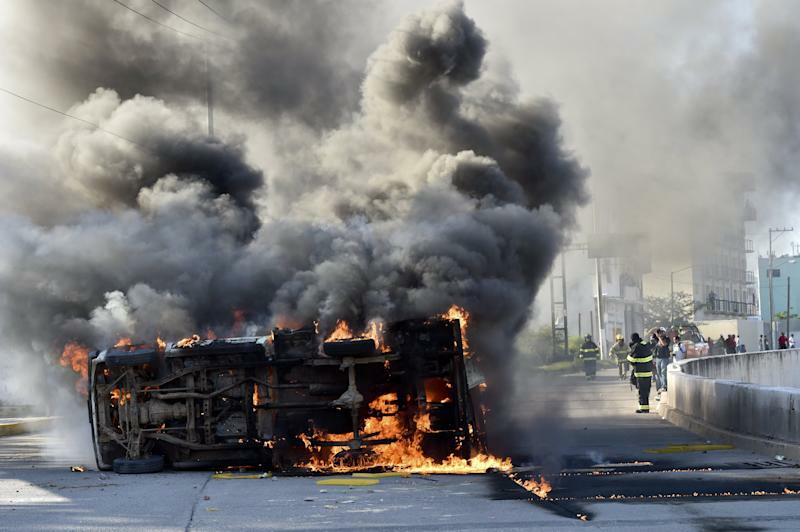 Students from a teacher training college outside Chilpancingo have been fuming over the fate of 43 comrades who vanished after their buses were shot at by municipal police in the city of Iguala on September 26. Authorities are investigating whether the students were buried in several mass graves found outside Iguala, some 200 kilometers (125 miles) south of Mexico City. Officials say the first DNA results could be announced this week. Prosecutors have detained 26 Iguala police officers in the case, accusing them of colluding with the Guerreros Unidos gang in a night of violence that also left six people dead and 25 wounded. Four gang members were also arrested along with four other unidentified people. Witnesses say they saw several students whisked away in police cars that night. The students are known for their radical protests, but they insist they went to Iguala to raise funds, though authorities say they also seized buses to return home, a common practice among them. 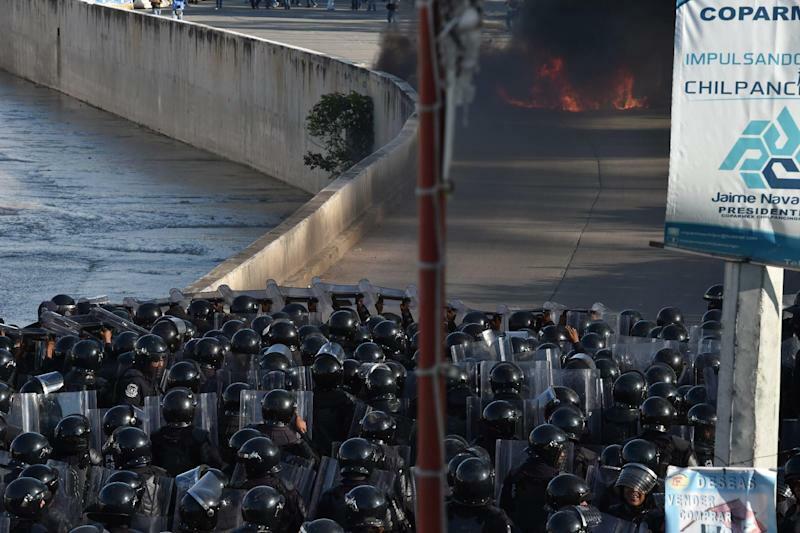 The case has drawn international condemnation and outrage among the Mexican public, bringing tens of thousands of people to protests across the nation last week. As the authorities wrestle with the mass disappearance, Guerrero police were caught in another controversial shooting late Sunday, when a state anti-kidnap unit fired at a van carrying two German students, wounding one of them. Prosecutors say the van ignored a checkpoint the officers had set up in Chilpancingo and that the officers shot at its tires to stop it after hearing a gun-like noise. The student was in stable condition at a Mexico City hospital, according to his school in Mexico, the Monterrey Institute of Technology.